A mistake I see many crossdressers and transgender women make is ignoring their eyebrows. Since eyebrows create the frame for your face, they are literally one of the first things people notice about you. Properly shaped eyebrows bring out your eyes and balance the proportions of your face. So how do you get beautiful eyebrows – especially if you can’t pluck? Check out the video below for step-by-step instructions on how to shape and feminize your eyebrows – featuring makeup artist Chris Scott (one of the guest experts in my Stepping Out Secrets Program). I promise you’ll be amazed at what an impact this has an your appearance! P.S. 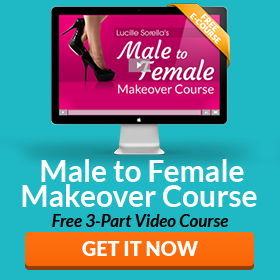 Want to learn more transgender makeup techniques? Check out my Stepping Out Secrets Program for Chris Scott’s complete TG makeup basics video tutorial. tell me please , How my eyebrows look like ? Video was fascinating to watch and helpful to understand what it is that creates the feminine appearance. I have begun to have my brows shaped via waxing when my body hair is waxed. I like the look the esthetician is creating, but I want to push it further. The video will help me talk about shaping at the next wax appointment. Thank you. Janine: read & agreed with your “brow “comments. At 71, I had surgery to raise my eyelids, not to sag off my lashes. ..big improvement ; cosmetically & visionwise. Brows are a big part fasciaI Fem….T.J.